Ghani Khan was born in January 1914 in Utmanzai, Hashtnagar, in present-day Charsadda in Pakistan’s northwestern province of Khyber Pashtunkhwa. His father was Khan Abdul Ghaffar Khan (Bacha Khan), a prominent and respected Pashtun leader who rose to international fame because of his teachings against violence and his efforts to fight for independence from British India without violence. Often dubbed “the Frontir Gandhi” [“Frontier” refers to the former name of the northwestern Pakistani province now called Khyber Pashtunkhwa], Ghani Khan’s father and Gandhi shared many of the same ideas and beliefs, but Bacha Khan is not known nearly as widely as Gandhi is. (I’ll write about Bacha Khan for next week.) As for Ghani Khan’s mother, Meharqanda, she hailed from a village nearby, married Ghani’s father in 1912, and passed away a little after World War I of influenza. She left Ghani when he was six years old–he was the oldest among his siblings. His younger brother, Khan Abdul Wali Khan (Wali Khan), Ghani’s younger brother, also grew up to be an influential leader, a politician, in Pashtunkhwa. Much of Ghani Khan’s poetry is about the mullah, the religious leader, the clergy. An understanding of his conversations with these mullahs in his poetry requires an understanding of Ghani Khan’s upbringing and his education. And so we proceed. Ghani Khan received his early education from a religious leader/teacher in the village local mosque; this was, and still is, a custom in many parts of the Muslim world, including Pashtunkhwa. Later on, however, he was sent to the National High School in Peshawar city and then later to the Azad (Free) School in Utmanzai, which was founded in 1921 by his father, Bacha Khan, with the assistance of the Anjuman-e-Islah-ul-Afaghina (Society for the Reformation of the Afghans). Here, he became proficient in Arabic and Urdu and passed the Punjab University Matriculation in 1927. He afterwards studied in the Jamia Milli (National College), Delhi, a Muslim religious institution founded in 1920 for the study of the traditional Islamic thought. Bacha Khan removed him from the institution in 1928, however, because of the clergy’s revolts against Amanullah Khan, who was the liberal, progressive Emir/King of Afghanistan (1919-1929) who wanted to modernize Afghanistan. Bacha Khan had initially intended to make an alim, religious scholar, out of Ghani Khan. But the revolts against and the removal of King Amanullah deeply disappointed Bacha Khan, and he thus decided to send Ghani Khan to England to receive Western education. Ghani Khan thus left for England when he was fifteen years old. Bacha Khan later arranged for Ghani Khan to be sent to the U.S. for education because he was not satisfied enough with Ghani’s British education. Afghanistan’s ambassador to the UK at the time sent him to the U.S. to study sugar technology at the University of Southern Louisiana. Unfortunately, in 1931, Bacha Khan, along with many other prominent congressmen, was arrested for “civil disobedience,” and their properties were restrained, leading to financial troubles for Ghani’s family. He therefore left the U.S. without completing his education–but he nonetheless worked in Takht Bhai Sugar Mills near his hometown in 1933. After his return from the West, he was highly influenced by Western lifestyle and attitude. Bacha Khan was displeased to see this, fearing that Ghani had lost respect and love for his culture, civilization, and history; as a result, Ghani was sent to Allahabad (India), where he stayed for eight months with Jawaharlal Nehru (1889-1964), an Indian politician and later the first Prime Minister of Independent India who treated and loved Ghani Khan like his own child. 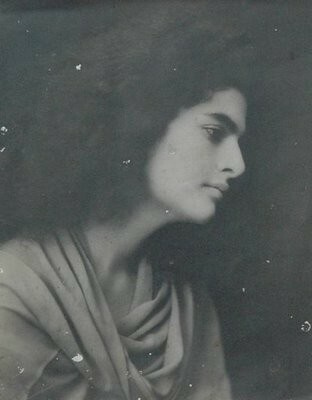 In February 1934, Jawaharlal arranged for Ghani Khan and his daughter Indira (later a Prime Minster of India) to study at Shantiniketan, a school established by an Indian poet, philosopher, and Nobel laureate. Here, Ghani Khan was elected President of the Students Union with Indira as the Social Secretary, and he studied Journalism, sculptor, and painting under famous and accomplished artists. 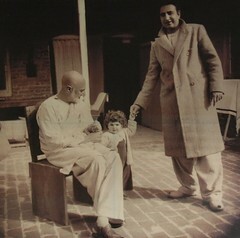 When Bacha Khan visited Shantiniketan, he resented the liberal co-educational atmosphere and the pre-occupation of his son with sculpture and painting; he had expected his son to engage in something of political and practical use, something that would be of use to them in their struggle against British rule. And so, he withdrew Ghani during the middle of his study at Shantiniketan. Even Mahatma Gandhi, the Indian non-violent soldier, attempted to intercede on Ghani Khan’s behalf–but with no luck. In December 1934, Ghani Khan went to Bombay where, at a friend’s house, he met and fell in love with Roshan (1907-1987), a Parsi lady of noble birth. [Parsis are a Zoroastrian community that migrated from Iran in the 10th century after the Islamic conquest and settled in India where they adopted Gujarati as their language.] After six years of courtship, she finally consented and married him on November 24th 1939. A well-educated lady of great beauty, culture, and sophistication, she brought almost six thousand books with her and was very supportive of Ghani’s artistic inclinations. She bore him two daughters, Shandana and Zareena, and a son, Faridoon. 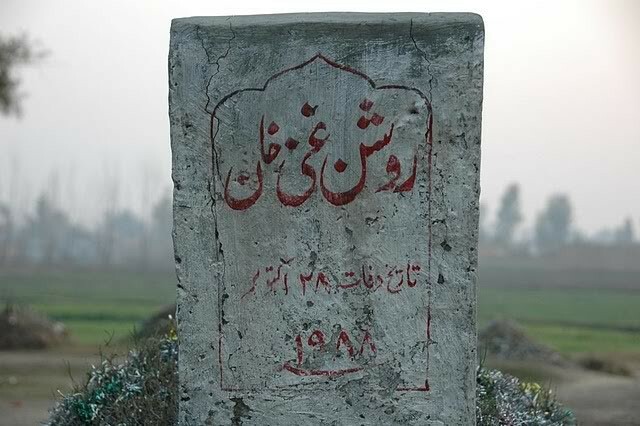 Faridoon died in 1987, about a decade before Ghani’s own death. During a part of Ghani Khan’s life, modern-day Pakistan did not exist. India was under British rule (hence called British India) and was fighting for its independence from the British. On August 15, 1947, India finally gained its independence. And a day before, on August 14th 1947, Pakistan had been born, becoming independent of British India. Hence, before all this independence, the Pashtuns who are now in Pakistan (all except the Swati Pashtuns, since Swat was an independent, princely state until 1964) were under the rule of British India before the partition of India and Pakistan. This is where and why Bacha Khan’s work was significant. As for Ghani Khan, he was initially influenced by his father’s political struggles and thus worked for the independence of the Pashtuns ruled by British India. However, he later came to disagree with his father’s ideologies (he stopped supporting the idea of non-violent resistance, seeing that it was not beneficial to the Pashtuns). He says, in an interview, that he left his father’s political movement of non-violence, called “Khudai Khidmatgar” (“God’s Soldiers”) because of some of the movement’s motives that he disagreed with. I left his [his father’s] [Khudai Khitmatgar] Movement and came and sat at home. He wanted me to become President of the Movement. I said no. He sent me all sorts of people but I said I will not do it. I had had a fight with him. I did not agree with his program. I am a bit of a socialist. I begged him to make an economic program. I told him Sir, there are eighty steps between communism and conservatism. Stand anywhere, choose any mixture, either way, nearer communism nearer conservatism, wherever you like but stand somewhere for heavens sake, and say this is my stand on economics. All these boys, I mean all the fellows who went with him to jail, their grandsons have passed BA and MAs in economics and political science. They keep on asking what is your economic program? And he said nothing. Although he was no longer involved in politics by the time of Pakistan’s independence (1947), the government of Pakistan imprisoned him several times, sending him to jails from all over the country. His father spent close to half of his lifetime in jail (44 years out of his 99 years!). Ghani Khan used his time in jail to write poetry; his main work in jail is called Da Panjrey Chaghar (“The Chirping of the Cage”). As mentioned above, his son Faridoon pre-deceased him. He died On October 6th, 1987 due to liver problems. On December 22nd 1987, Roshan, his wife of over four and a half decades whom he loved deeply and passionately, passed away due to heart failure. He became lonelier than ever before, but the births of his grandchildren managed to take some of the loneliness away–although his close friends said of him that he was never the same after his wife’s death. Ghani Khan died on March 15th 1996 and was buried the next day, next to his mother in his ancestral graveyard outside their village. People from all over the province, the Tribal Areas, Baluchistan, and Afghanistan attended his funeral, and his death was widely mourned as the passing away of a great poet, painter, sculptor, and leader. Then-president Farooq Ahmad Khan Leghan and then-Prime Minister Benazir Bhutto visited Ghani Khan’s village to give condolences to his family. On March 23, 1980, General Muhammad Zia-ul-Haq, Pakistan’s president from 1978-1988, granted him the prestigious award of Sitara-e-Imtiaz (Star of Excellence) for his contributions to Pashto literature and painting. Additionally, the Government of Khyber Pashtunkhwa Province has built a public library and park as a memorial to him on about eight acres of land; it is called Ghani Derai (the mound of Ghani). The site is a historical mound built close to his home, encircling his ancestral village of Utmanzai on the main highway. At least three books about him have been published after his death. One is Ghani Khan: A Poet of Social Reality by Arif Khattak. The other is Strains of Romanticism in Abdul Ghani Khan and John Keats (Poetry, A Comparative Study) by Shazia Babar, who wrote her PhD dissertation on Ghani Khan’s and John Keat’s poetry, noting the similarities between the two poets’ philosophies and styles. 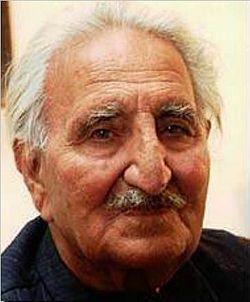 In 2009, the book “Ghani Khan- Da Pukhto Adab da Shalami Sadai Shakhsiat (Pashto, “Ghani Khan – The 20th Century Pashto Literary Figure”) was published; it is “a thesis by late Fazli Ghani Ghani, the eminent Pashtun writer who was killed when a suicide bomber targeted the house of Asfandyar Wali Khan on October 2, 2008,” Muhammad Zai Khan writes on his blog. And, oh yeah, about a year ago, I wrote a poem in his name entitled “Weeping at Ghani’s Grave.” Yes, I do feel like the tribute of little fans like me counts, too. Ghani Khan has several interviews on Youtube. This is a good one to start with to hear him talk: Khan Abdul Ghani Khan Interview, Part I. Then there are also interviews conducted with Sardar Ali Takkar, an influential contemporary Pashto singer who sings Ghani Khan’s poetry with a mesmerizing melodious voice. In this short clip, Takkar tells us that Ghani Khan told him that he swears they complement each other perfectly: Ghani’s words sung in Takkar’s voice. I had intended to include my personal thoughts on Ghani Khan in this post. I wanted to share with my readers what happens to my mind when I think of him, when I listen to his poetry, when I read him … I wanted to sketch to you all that smile that is almost permanent on my lips because of Ghani Khan. It’s the kind of smile that no grief, no sorry has the power to remove. I wanted, also, to discuss his poetry, the themes of his poetry, their meaning, their power, their wisdom. I want to go into details discussing Ghani’s understanding of God and religion as I understand from his poetry alone. But this post has gotten long enough already, so I’ll have to talk about that in another blog post. Thank you for reading! Stay tuned for more Pashtun Personalities. This entry was posted in forbidden things, Pashto, Pashtun Leaders, Pashtuns, Poetry, society, Writing and tagged Pashtun Leaders, Pashtuns. Bookmark the permalink. It’s a nice effort to introduce Ghani Khan to people like me who are unaware of such pashtuns of grandeur . A very good article about Ghani Khan. I am a little concerned about the inconsistencies in the timeline. He graduated from high school in 1927. That means he was 13 yrs old then. That is troublesome. Jinnah went to England when he was 16, right after high school graduation. That is feasible. At 15 Ghani Khan went to England, then transferred to a Louisiana university and returned at age 17 and started working in Takhtbai bai. Again, a managerial position. But over all the story is fabulous. I saw Ghani khan twice in utmanzai when I was a little boy. My father was almost the same age as Ghani khan and somehow he went with them to Delhi to study. Either bacha khan took him along to help my father or as a helper but my father did graduate from high school and studied a while in Jamia Islamia with Wali and Ghani khan. I wish I had learned more about the circumstances but he is no more. My father was not rich and could not afford his education but somehow he got, perhaps through the charity of bacha khan. Thanks for writing a great article about Ghani khan. Mohammad k khan ph. D.
Mehar Wanda the mother of Abdul Ghani khan married Bacha khan in 1912? Then Abdul Ghani khan born in 1912? Please correct the timeline. Then the article is the best big brother!
? The post says Ghani’s parents married in 1912, and he was born in January 1914. There’s no issue in the timeline. In the future, verify your “corrections” before pointing them out. P.S. A child takes 9 months to develop; there are 12 months in a year. What do you say about Ghani Khan and Feminism? Despite the fact that he was a revolutionary, he never said anything about the oppression of women? I don’t expect every single human (revolutionary or not) to speak on feminism, so I find your question very odd. In one of his poems, he has a misogynistic line that goes something like “waak ye che da bal wee dagahe nar na zanana kha da” (even a woman is better than a man who is subjugated/dependent on others)., so I actually don’t have high expectations of Ghani Khan or any other revolutionary. The problem with too many so-called revolutionaries is that their vision was always too limited – they didn’t have the courage to demand and work for change within their own families; they work for the broader society, as if that’s going to help anything. Ghani Khan, A great & my favorite poet.